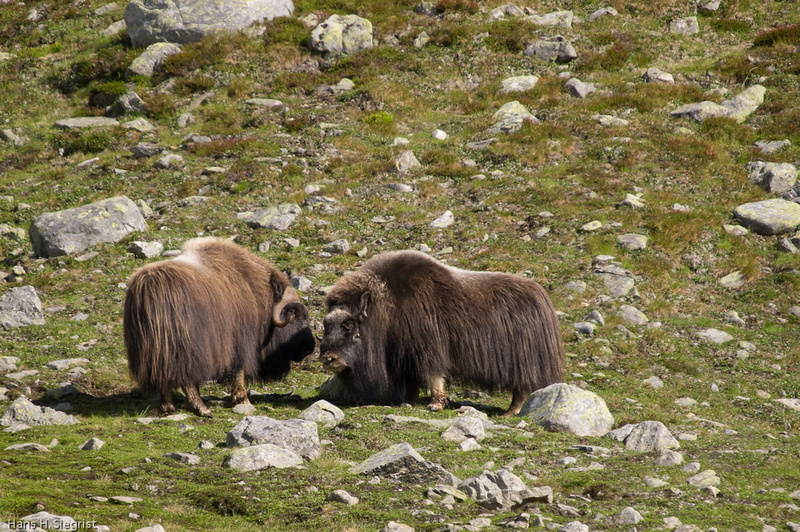 Musk Oxen (Ovibos moschatus) are a species dating back many thousands of years that survived only in northern Canada and Greenland. In 1947 they were introduced to the Dovrefjell National Park in Norway from which some have emigrated to form small colonies in Sweden. 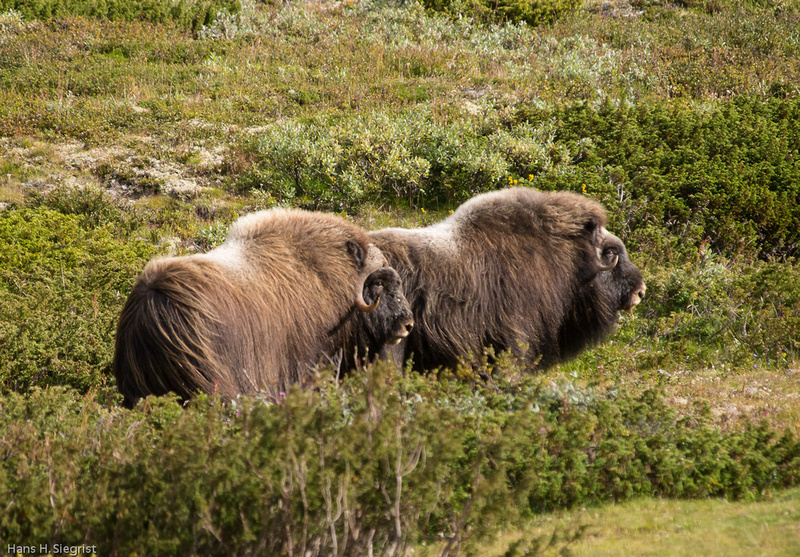 Nowadays they can be found in Canada, Alaska, Greenland, Siberia, the Kola peninsula and in Scandinavia. The populations are thriving and their survival is safe. Dovrefjell alone harbours almost 400 individuals. To get to Dovrefjell one has to follow the E6 road from Dombås to Kongsvoll and leave the car on the car park beside the road. The footpath starts on the other side of the road leading over a wooden bridge and below the Dombås-Trondheim railway line. It climbs through a lovely birch forest up to the vast plain of the national park. 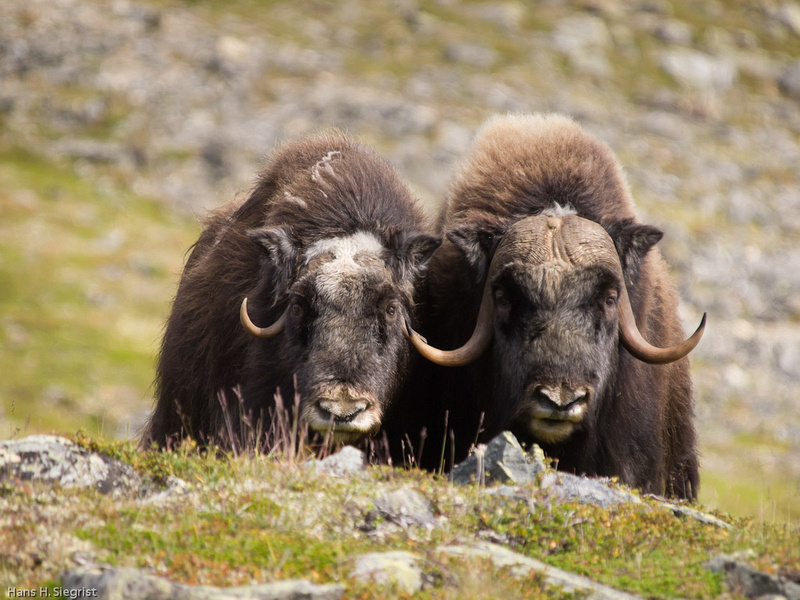 It then continues for several kilometres through a tundra landscape above the treeline and the first musk oxen will become visible. Once in contact with the animals the photographer can start a slow approach to get pictures of these gentle animals which are, by the way, closer to goats than to bovines. Females with calves and isolated bulls can be rather aggressive, although serious accidents are rare. Proceeding carefully can result in lovely portraits of both male and female animals. No need to take very big lenses. A medium range telezoom like a 100-400mm with a 1.4x converter will cover almost all situations where the light is bright enough..
das sind wirklich sehr beeindruckende Tiere, und eine tolle Fotostrecke.